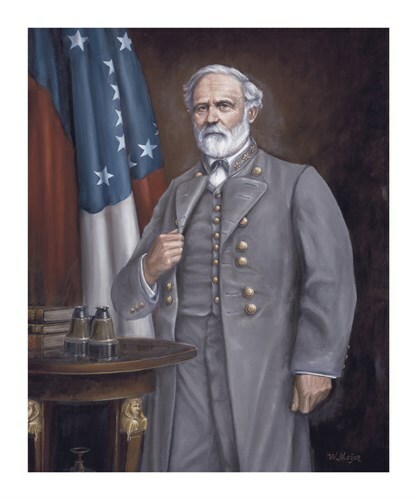 Epitomizing the Southern Confederate cause is General Robert E. Lee, often known as ‘Gray Fox’. General Lee was a man’s man and during the war, he became an idol to his people, men and women alike. Confederate General Clement Evans described him as “the only man living in whom the soldiers would unconditionally trust all their power for the preservation of their independence”. Lee is recognised amongst historians as playing a vital and integral part of the history of the Civil War. His successes include the ‘Seven Days Battle’ (in which he stopped McClellan's advance), the great three day battle of Gettysburg in 1863, and in the battles of the Wilderness, Spotsylvania, North Anna, and Cold Harbor in 1864. Lee’s strategies were daring and audacious, and on the battlefield his influence over his men was extraordinary. Meijer based the appearance of General Lee on contemporary photographs, accounts and more specifically the 1864 Julian Vannerson’s session. Lee is wearing his usual field uniform frock coat with Colonel’s insignia and Virginia State seal buttons. On the empire-style table is his inseparable pair of field glasses, now in the possession of the Museum of the Confederacy, and three Confederate Army Manuals. Lee is standing in front of his personalised Headquarters flag, which he used during the earlier part of the war.